Rising, Resisting and Reclaiming: Using our Stories and Scholar Activism to Decolonize Systems of Oppression. 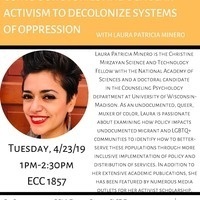 Speaker Laura Patricia Minero is the Christine Mirzayan Science and Technology Fellow with the National Academy of Sciences and a doctoral candidate in the Counseling Psychology department at University of Wisconsin-Madison. As an undocumented, queer, muXer of color, Laura is passionate about examining how policy impacts undocumented immigrant and LGBTQ+ communities and to identify how to better-serve these populations through more inclusive implementation of policy and distribution of services. I was studying about MBBS in russia at http://mbbsadmissionabroad.in/mbbs-in-russia/ and came through this event, Great effort guys heard a lot about you.